Evocative expression is something we expect of nature poetry, but how is it successfully achieved? The sixty-two poems of Barnes-based poet Franco Pagnucci’s Tracks on Damp Sand offer a lesson. His fifth collection of poetry seems to channel the spirit of Thoreau, evoking in the reader a sublime feeling of being a part of an organic whole, a melding of the human and the natural that seems almost ordained. A good teacher doesn’t tell his students what to think, but awakens them to new thoughts and feelings. Tracks on Damp Sand sends us to the amazing classroom of the outdoors to face the nature of nature, to see with the poet’s eyes details so easily missed. and how you called me to the window? are on the back of your hands. in her new gray with black spots. left of center, next to the trunk. then settled back against his side. The human participants in these poems recognize themselves as part of the landscape. They own nothing, take nothing more than the creatures around them. 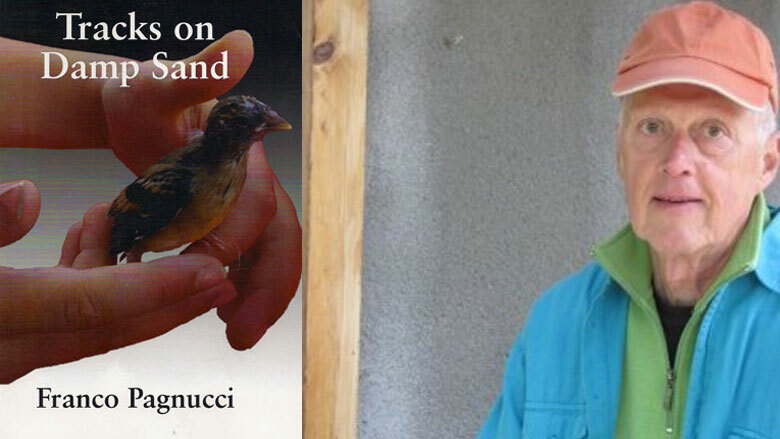 For Pagnucci, nature has the power to stop us in our tracks like that sparrow on the shoulder, reveal what is important, and connect us to something larger. Like Thoreau, Pagnucci values simplicity—a hallmark of effective poetry. Simple experience guides Pagnucci’s syllabus, and his instructions are clear: look-see, hear-listen, never intrude, and always, always keep learning. that she must have whistled. even if I love what green is left.